How can we evolve through adversity and change our lives? It is one of life's great questions. 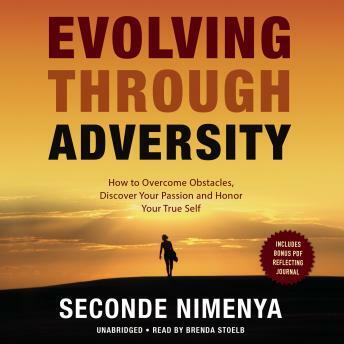 In Evolving through Adversity: How to Overcome Obstacles, Discover Your Passion, and Honor Your True Self, author Seconde Nimenya answers the above question and demonstrates that the best way to overcome adversity is to go through it. Through her own life story, Seconde explains how to apply this theory by what she calls the RRU model (Reflect, Rectify, and Unite). Her personal credo to evolve through all adversity and achieve any desired outcome is to take time to reflect on who you are, then assess your situation, rectify what you don't like, and reinforce or unite what you do like. Seconde details her life story, from walking hundreds of miles to school across mountains, being struck by lightning, and having to hide in the bushes when a civil war erupts in her native country. Then she undergoes culture shock as she comes to North America and realizes how her cultural background both helps and hinders her in evolving into the woman she wants to be.